This is one of the first photos that I took of my avatar, a few months after I created her. I still hadn't settled on a shape or skin that felt like "me," so I'm using the freebie Caramella skin and a random shape from Free Dove. 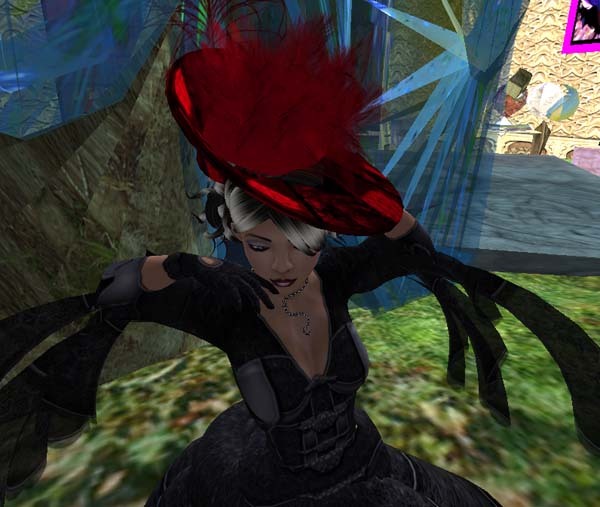 Hat by Skye Qi, dress was my FIRST from ~silentsparrow~. Freebie "slither" necklace and Diversity hair's Brat in black. Miss Lavendar Beaumont tagged me to discuss eight random facts about myself. (1) Looking at RL me, nobody would ever guess that I'm half Thai. (2) I have a three year old daughter. (3) I am getting a PhD in education, in my (almost) last year. (4) The fine girls of Closet Crisis inspired me to keep this fashion blog. (6) Indoor spaces in SL make me feel claustrophobic, as if I'm playing Doom or Quake or something! (7) I'm a huge anime and manga fan. (8) I'm also an enormous geek and like to play RPGs, both online and tabletop. Cheers. I tag hyasynth, Jackal Ennui, Violet Voltaire, Siri Woodget, Michael Smith, and (evil laughter) all of Caledon. I'm so glad you are posting more now! I love your outfits and adventure. Also your daughter is absolutely adorable and I like reading about her adventures hehe thank you for sharing that with me.